Sometimes I feel like I'm cheating in the summer. The ingredients are so good that I really don't have to do much apart from cut and assemble. There is a bit of art to figuring out combinations of flavors, but honestly...there isn't *that* much I can do to a perfect watermelon to make it better. This Watermelon Tomato & Burrata Salad came about on a weekend afternoon when I was staring at the fridge incapable of deciding what I wanted to eat first. I'd just done groceries, so we were stocked. Watermelon. Tomatoes. Berries. Fresh herbs. Burrata cheese. I wanted to eat all of it at the same time. This watermelon salad recipe is perfect for those of you who like a little sweet with your savory. 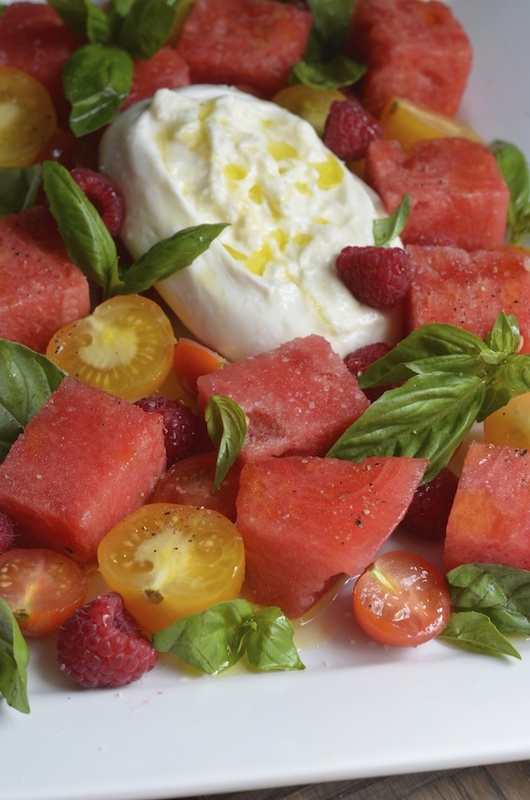 Fresh juicy cubes of watermelon, ripe summery tomatoes, and just a handful of berries are the perfect complement to creamy burrata cheese. Serve this as a first course when entertaining guests, or as a simple lunch when it's just you on a pretty summer afternoon. 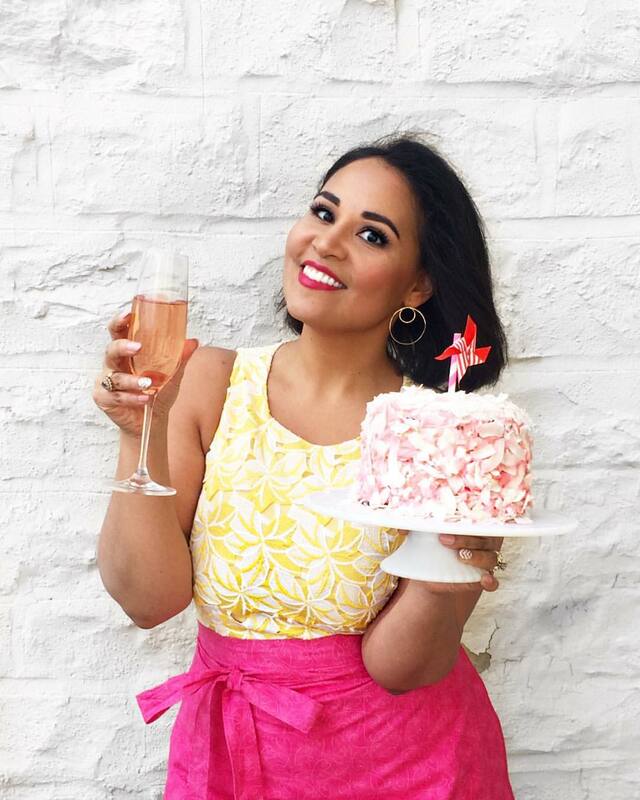 Don't forget to take a picture and tag me @alwaysalejandra and #alwaysorderdessert on Instagram. I want to see what you're cooking! Use a knife to gently slice off a thin layer from the top of the burrata (no thicker than 1/2") to open it up. Place in the center of a serving platter with the cut side up. 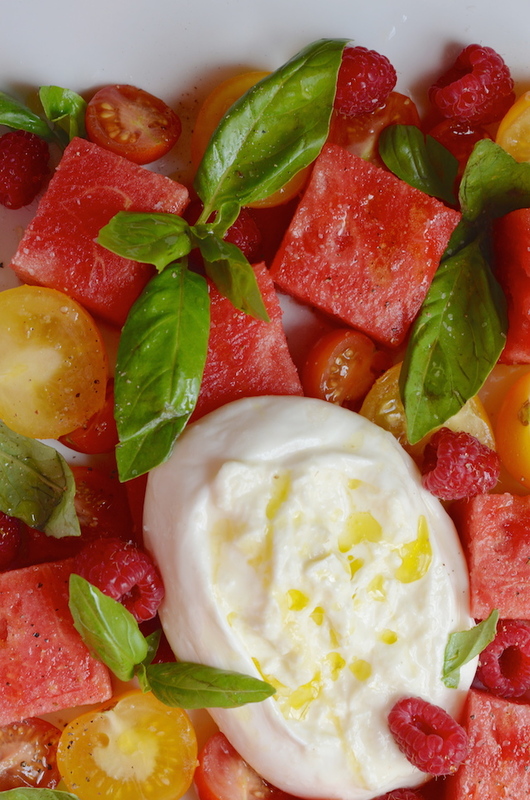 Arrange watermelon and tomatoes around the burrata. Sprinkle with raspberries, and tuck in basil leaves around the dish. Drizzle the entire platter with the olive oil, then squeeze the lemon juice just over the fruit (not on the cheese). Season the whole salad with kosher salt and black pepper.